A plane of US-Bangla Airlines crashed in Kathmandu on Monday afternoon leaving at least 49 people dead in one of the worst accidents involving Bangladeshi aircraft. The plane of the private carrier met with the accident while landing at hill-ringed Tribhuvan International Airport (TIA) around 2:40pm local time with 67 passengers and four crew members on board, according to authorities of the airport. Thirty-two of the passengers were Bangladeshis, 33 Nepalese, one Chinese and one Maldivian. The Bombardier Q400 series aircraft with call sign S2-AGU caught fire after it careened off the runway during landing and crashed onto a football ground near TIA, said the airport’s spokesperson Prem Nath Thakur. According to a Bangladesh foreign ministry statement, 22 of the passengers and crew members, including 9 Bangladeshis, have been rescued alive and taken to hospital. The statement said some of the survivors are critically injured and that detailed identities of all of them are not yet confirmed. Earlier Nepalese rescuers said they have recovered at least 50 bodies. “We’ve recovered 50 dead bodies so far. 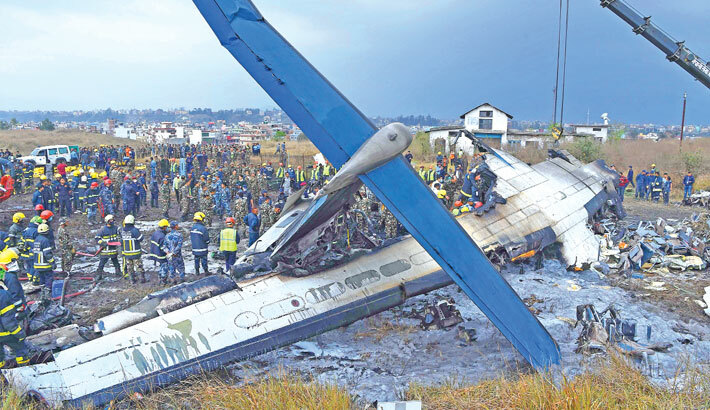 Several people have been rescued from the burning wreckage of the… aircraft but nine people were still unaccounted for,” said Nepalese Army spokesperson Gokul Bhandari. US-Bangla Airlines chief executive officer (CEO) said they got the news of the plane crash immediately after the accident and was processing to send an expert team to Nepal. He also said the accident might have happened due to the miscommunication between the pilot and signal tower. A conversion between the pilot and the control tower at TIA, which has gone viral on the social media, substantiated his claim. Civil Aviation Authority of Nepal (CAAP), however, hinted that ‘unusual landing’ might have been responsible for the accident. “The aircraft was permitted to land from the southern side of the runway flying over Koteshwor, but it landed from the northern side,” said CAAP director general Sanjiv Gautam. “We’re yet to ascertain the reason behind the unusual landing”, he said. TIA general manager Raj Kumar Chettri told the local media that all on a sudden the plane shook violently and there was a loud bang. Relatives of Bangladeshi passengers have been passing time with great anxiety since the news of the accident spread. Shahriar Mithun, brother of Sanzida Bipasha who along with her husband Rafiq Zaman Rimu and six-year-old son Aniruddha were among the passengers, said they are very much upset after hearing about the accident. Mithun said he himself saw off the three members of the family at Shahjalal International Airport in Dhaka at 12:30pm. Bahadur Bepari, uncle of another passenger Ahmed Foysal, said they were not sure if he is alive. Forty-nine passengers were killed in the crash of an aircraft of Biman Bangladesh Airlines near Dhaka airport on August 4, 1984. After the Monday crash, Prime Minister Sheikh Hasina talked to his Nepali counterpart Khadga Prasad Sharma Oli over phone in the evening and inquired about the condition of the passengers in the plane. During the talks Sheikh Hasina assured the Nepali prime minister of extending any kind of assistance it may require. Sheikh Hasina also said Bangladesh would send a rescue team to Nepal whenever communication would be reinstated in the airport. In reply, the Nepali prime minister expressed his profound shock at the casualties in the accident. He said he went to the airport just after the accident occurred and directed the authorities concerned to take necessary steps in this regard. Meanwhile, civil aviation and tourism minister Shahjahan Kamal said a team of Civil Aviation Authority, Bangladesh (CAAB) will fly to Nepal to ascertain the reasons behind the accident. US-Bangla Airlines is a unit of the US-Bangla Group. The private carrier launched operations in July 2014 and has eight aircraft.